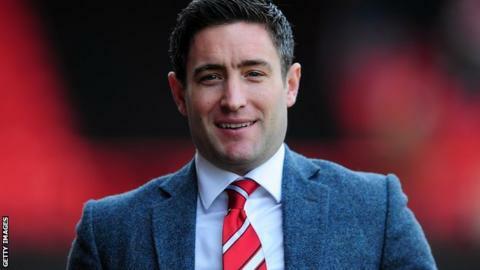 Barnsley manager Lee Johnson has asked for time to change a "losing mentality" at the struggling League One club. The Tykes were knocked out of the FA Cup in the first round on Saturday by National League side Altrincham. They have also lost their last seven league games, and 34-year-old Johnson admitted it had been a "shocking run." He told BBC Radio Sheffield: "I understand people want me gone. If I do stay - and I want to and believe I will - I know what we require." Johnson continued: "I have to take full responsibility and I do. It's my place to make changes, whether that be changing personnel or rallying the troops. "We have to put people out there that we believe will play for the badge on the front and not the name on the back." The former Oldham boss joined Barnsley in February on a three-and-a-half year contract, but the Reds have struggled to make an impact this season. They have won just four of their 16 matches, leaving them in 22nd place in League One. Barnsley are in their worst run in 56 years following seven consecutive league defeats. They finished bottom of the old Division Two in 1959, losing 25 of their 42 games. "The whole club has to assess the way to move forward because there's too many losing mentality characters around the place," he added. "The Under-18s rarely get a win, the Under-21s haven't got enough wins and we haven't got enough wins. Something has to have a clean sweep of the mindset and change."